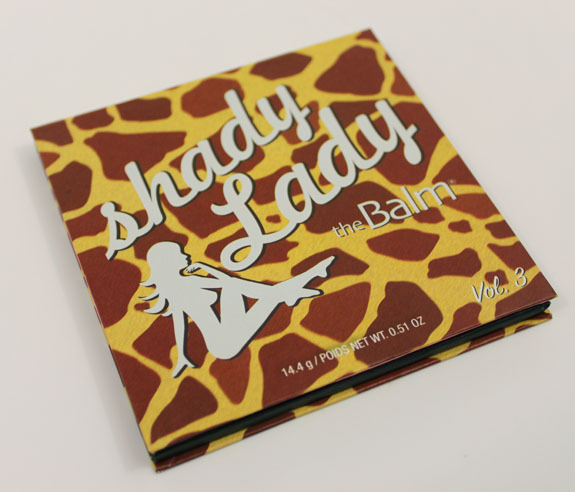 theBalm has three Shady Lady shadow/liner palettes out and Vol. 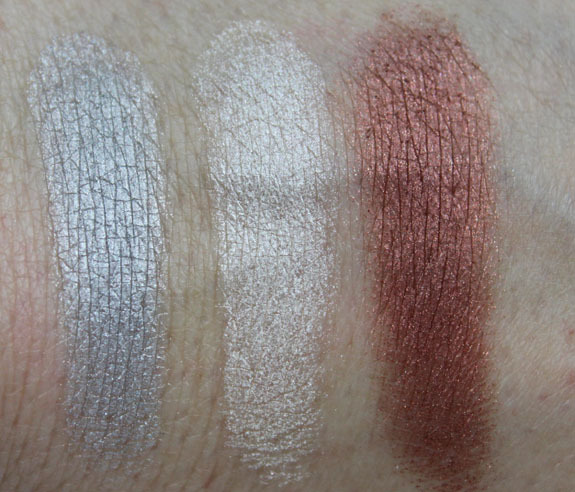 3 is the newest one which features nine shimmery saturated colors. I am fairly new to theBalm but so far really liking everything I have tried. Plus they are a San Francisco company and I always like to support cool local companies! 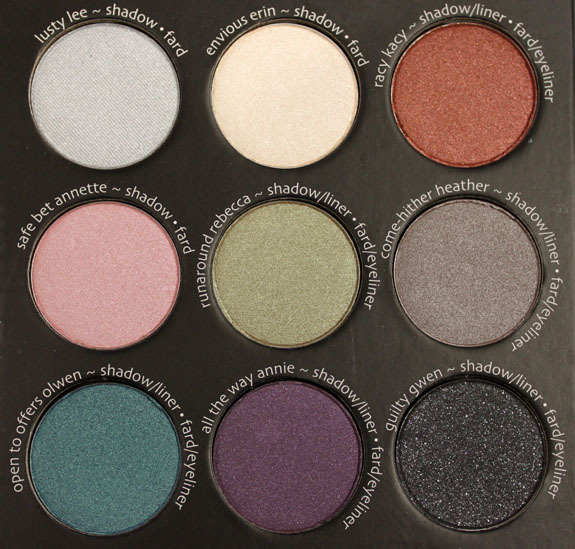 The names of these shadows are super cute and fun, which is yet another reason to love them. 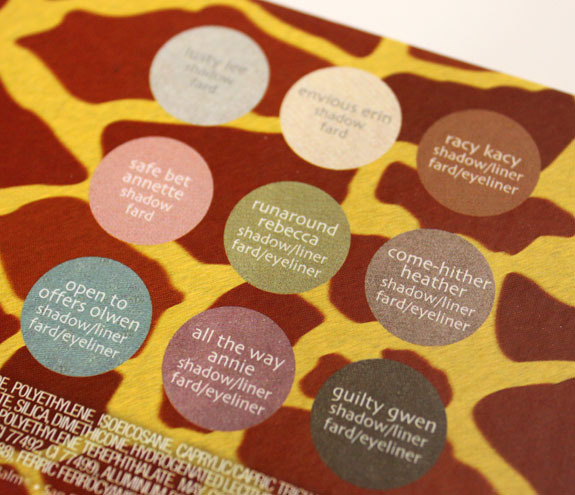 The palette comes in a fun giraffe print on the front and then lists all the colors on the back. It’s a heavy sturdy cardboard palette with a large mirror inside. It does feel like it would do a good job protecting shadows as long as they didn’t get completely crushed. I was really pleased with all the colors in this palette. They were all very soft and nicely saturated. Even the black glittery one felt soft not gritty, and was really dark. I like how they say next to the name which ones are good as liners also. Helpful tips are always appreciated! What do you think about Shady Lady Vol. 3? Which are your fav products from theBalm? wow I really like these colors, don’t have much that can compare to any of them. I’ve never tried this brand before. you have me quite curious to do just that! 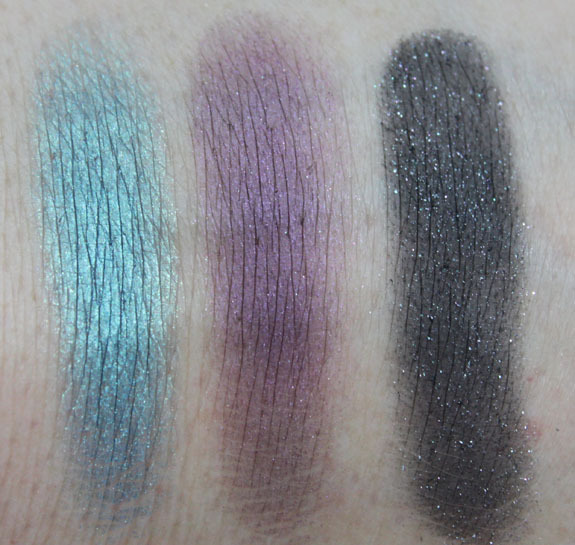 These shades are marvelously pretty. 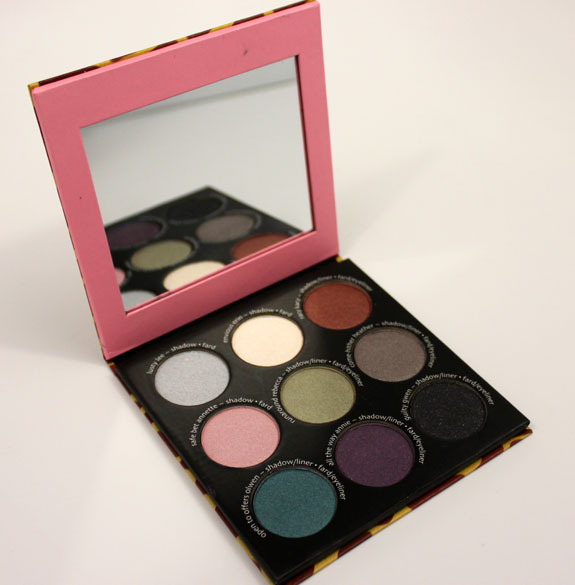 I really like this palette too and have been using both Vol. 2 and 3 quite regularly. I also like their blushes. theBalm makes really good quality stuff but sadly, their range is not as wide compared to most makeup brands. Nice palette! Guilty Gwen looks gorgeous. very pretty! I don’t own anything by them yet, but I think that will soon change!! Are they full sized pans? I’ve never actually bought any of the Shady Lady palettes though I’ve always picked them up whenever I’d stop by Sephora. I guess the other palettes end up stealing away my attention. 😉 Might give it a shot soon tho! Carmela´s last post…A Quick Thank You and Preview Post! Each pan in the palette is about 0.06oz. They’re not full-sized if you compare them to theBalm’s single eyeshadows (which are a whopping 0.12oz), but compared to pretty much every other brand out there (Urban Decay singles are 0.05oz), they’re full-sized pans! I really like their products. I use their Mary Lou-Manizer, which is great, and their blushes are the only other blushes I kept in my collection after finding Tarte’s Amazonian Clay Blush- everything else got dumped. Their “Down Boy” will make you look like you’ve been slapped by 1,000 Tiny Angels, and that’s a very good thing. (especially if you’re doing a smokey eye OR a bold lip and want to keep the blush from competing) Just a flush of natural color. Perfect. I just wish they’d bring back the Shady Lady Volume One palette. It was awesome, and I missed it! I love TheBalm eyeshadows. I didn’t give them much thought until recently and now I have Volume 2 and 3 plus a single (All About Alex). Great lasting pigment. I think it’s going to take a lot for theBalm to make something more impressive than Volume 1. I have a lot of eyeshadows and quite a few palettes but, I make sure I always have Volume 1 with me. Volume 2 and 3 are nice but, not as striking. They have these at TJMAXX for $16.99. I picked this one and balmbini yesterday. At that price you can grab both! I grabbed mine from TJ Maxx for $16.99 xP I love it! 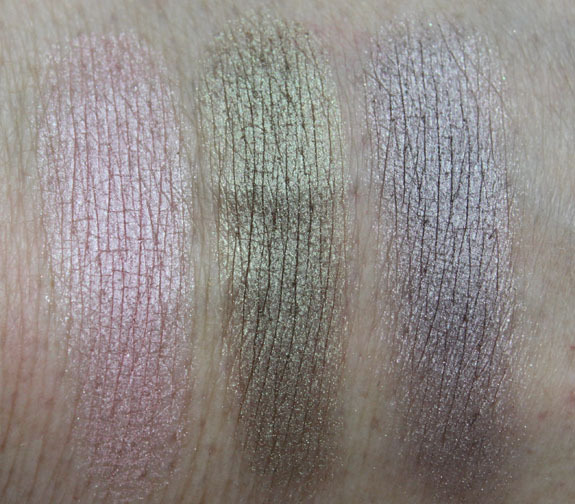 I REALLY need to indulge in more theBalm eyeshadows. I wish I knew about the brand for their Shady Lady Vol. 1! I totally just did a post about all the TJ Maxx sightings! TheBalm palettes were only 16.99 and I got both vol. 1 and 2! I was wondering if they are cruelty-free but since you did a post, I assume they are? I’ll repeat what the last two commenters said…check your nearest TJ Maxx or Marshalls if you want to try some TheBalm products out. It’s a good way to see if you like their products before splurging at full price.